A covey of hummers amid ocotillos. More of a welding effort than forging. 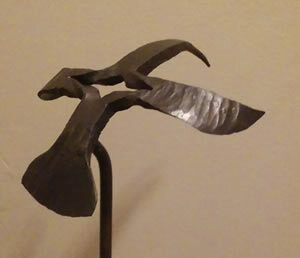 But, that's why I call myself a metalsmith! This is a downlaodable PDF file from the Houston Area Blacksmiths Association (HABA) dated June 2005. 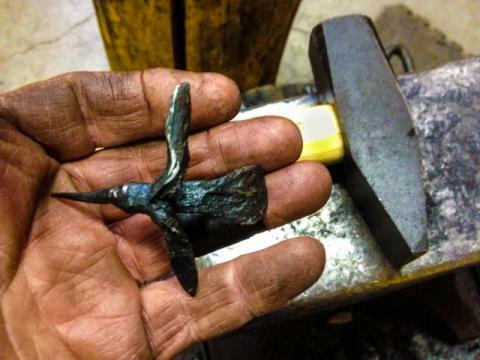 According to the article this is a modification of Bill Epps method of forging a hummingbird. 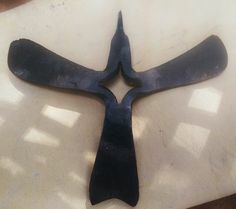 In my perusing of blacksmithing websites I've found HABA to be one of the best. Consider joining them if you find their site useful. $20 for a year's membership is a cheap price to pay for the information they post. Double clicking on either the picture or the blurb underneath it will download the article to you. Find the spot where you're going to put your nest. It should be sheltered against heat and rain, as well as stable so your nest will sit snugly. 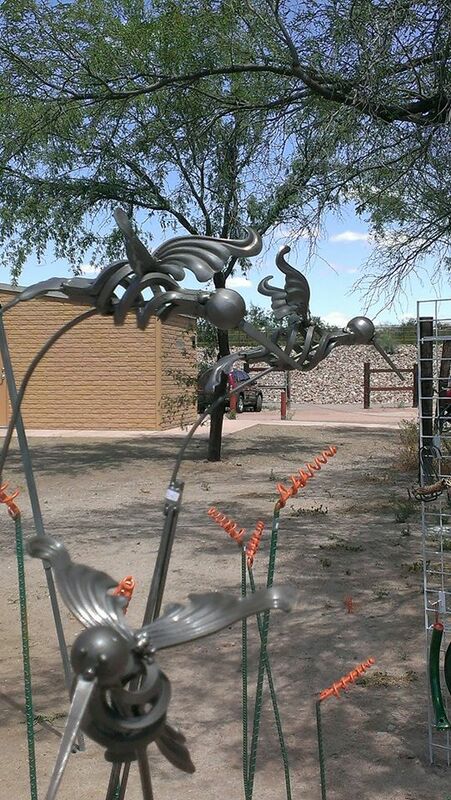 Hummingbirds often nest near water sources where the plants are thicker and the temperature cooler. Collect your materials according to the spot you've chosen. If it's in a shady area, choose darker plant matter such as browning leaves. A sunnier nest should have lighter material in order to camouflage it more effectively. Bend the small twigs into the cup and work them to form a roundish skeleton. This will be the frame for your nest. Build up the other material around the frame. Start with leaves, plant matter on the outside. As you work your way in, use more lichen and moss to create a soft cushion for the chicks. If you're having trouble keeping it together, use a tiny bit of Elmer's glue to hold it. Line the inner wall of the nest with unrolled cotton balls to add an extra-soft layer. Place the quarter in the center of the nest. It should comfortably fit flat on the bottom. Hummingbird eggs are the size of a jelly bean, and the chicks are very small. The nest needs to be proportionate! Remove the nest from the tea cup. 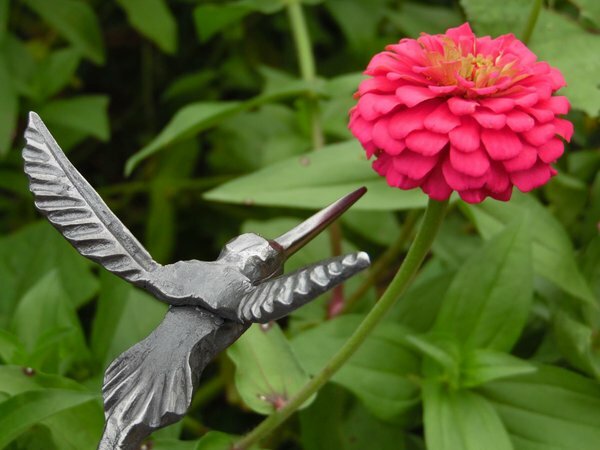 It will likely be fragile, as hummingbird nests are, but if you've done it right, it will stick together just fine. Set the nest in the spot you've chosen and wait for a female hummingbird to find it and set up camp. 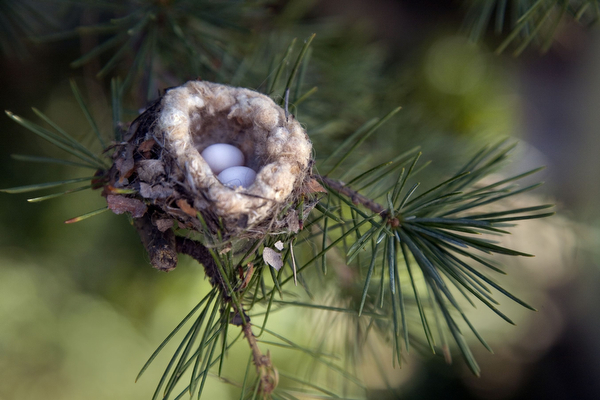 Hummingbird nests are about the size of half a walnut or golf ball -- about 1 1/2 inches across. Their nests are heavily lined with soft material when first built. The soft material expands to accommodate the two 1/2-inch eggs, then later to make room for the growing hatchlings. The mother birds repair the nests repeatedly during the season. Hummingbirds use a wide variety of nest materials. The inside part of the nest is lined with spider web silk, cotton fibers, feathers or fuzz from leaves. They also use cotton fluff, dryer lint and soft pieces of plants. The spider web silk serves as a glue to hold the nest together, and the webs are also flexible. This helps as the nests expand for the growing hatchlings. Although sometimes thought of as backyard birds, hummingbirds like to nest away from people and predators. They usually build nests in an isolated area, away from backyards and busy neighborhoods. Hummingbirds avoid birdhouses and look for appropriate branches in bushes or trees that are 5 to 20 feet off the ground, depending on the species. The birds usually look for a solid "Y" at the base of a branch that is shaded from sun and sheltered from rain and wind. Because hummingbirds are small, they are easily tossed by wind, drowned by rain and overheated by the sun. The female hummingbird uses her body to mold and shape the nest. She sits in the nest and pushes on it with her wing to form it. She rounds out the inside with her rump, and compacts the nesting material in the bottom of the nest with her feet. She builds the bottom of the nest and the wind side of the nest thicker than the other sides, which helps regulate the temperature in the nest. Most nests only survive one season. Hermit hummingbirds are an exception to the cup nest rule. Hermits build pendulum nests that hang from a branch or other piece of vegetation. The nests are shaped like an inverted cone, with the widest area at the top where the eggs are laid. Hermit hummingbirds use very little soft, downy material, instead choosing stems of moss, plant fibers and similar material. Hermits do use flexible, sticky spider web fibers to hold their nests together, just like other hummingbirds.